Twice an All-American at Ohio State, Tracey Hall Yarbrough started every game of her collegiate career. She led the Buckeyes to three consecutive Big Ten championships (1985-87) and four trips to the NCAA tournament. The Buckeyes advanced to the Regional final in 1985 and 1987. OSU’s overall record during Hall’s career was 102-20. The talented forward scored in double figures in 101 of those 122 games and grabbed double-digit rebounds in 50 games. 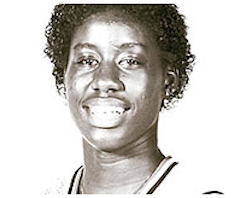 She made the All-Big Ten first team three times and was the conference Player of the Year in 1986 and 1987. Her scoring averages were 12.8, 16.6, 16.3 and 17.1, but she also averaged 9.1 rebounds in her career. Hall was the first OSU player to gather more than 300 rebounds in the season. She still ranks high among OSU players in games played, points scored, field goals, rebounds, steals and blocked shots.